Anika , a Frenchton, has a litter of babies born 11/28. The sire is Yogi, an AKC French Bulldog. 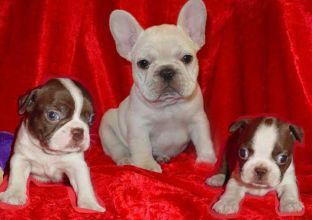 These babies are 3/4 French Bulldog 1/4 Boston Bulldog. They are fat, healthy and ready to go to a forever home.. They have been vet checked, vaccinated, wormed and are Micro-Chipped.